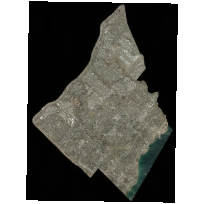 The 2016 City of Mississauga digital mapping data contains very detailed topographic and planning information clipped to the City of Mississauga municipal boundary. This data set contains the lower-resolution TIFF version of the imagery for view, and a high-resolution ECW version for direct download. The lower resolution imagery is 15 cm resolution, while the higher resolution is 7 cm resolution. The high resolution imagery is only available every 4 years. The original format of the raster image are .ecw and .ers. It is converted into GeoTIFF due to the large size of original data. The data loaded come from the Q3 shipment from the City of Mississauga Transportation and Works Department. In some cases, data represented in q2 that aren’t provided in other quarters is loaded and indication of the source date is mentioned in the metadata for that dataset. All maps use rectangular coordinate values expressed in metres and based on the 6 degree Universal Transverse Mercator system, NAD 1983 (adopted).